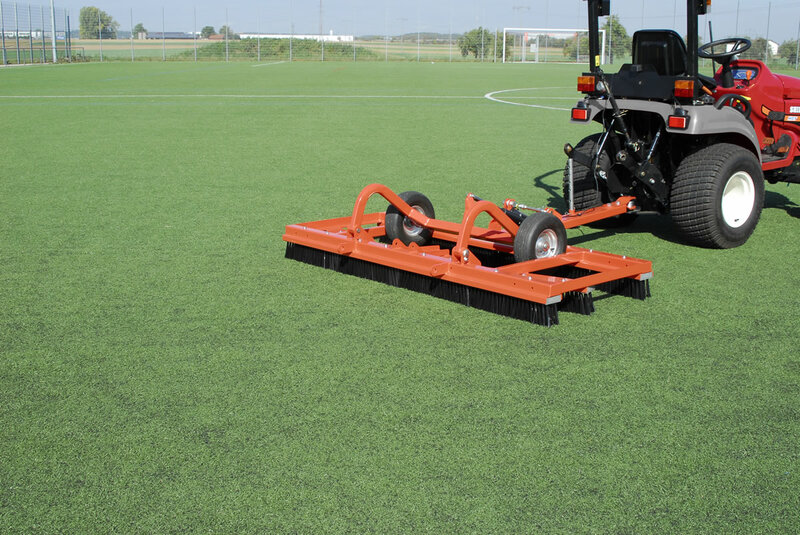 Lightweight compact brush for both artificial and natural turf. The TERRA GROOM brushes in rubber crumb and sand (artificial) or sand and top dressings (natural). In either situation it is used very successfully to ‘groom’, up-righting turf filaments (artificial) or helping the grass blade stand tall (natural). Two rows are straight and one row is mounted in zigzag alignment for intensive and even brushing. The TERRA GROOM is easy to pull because of its weight of just 90 kg.. The TERRA GROOM is optionally available with rear 3-point hitch for tractors or with carriage and drawbar for attachment to utility vehicles. The carriage is lifted electrically. Optional equipment: Black stiff brushes, white soft brushes, magnet strip for collecting metal objects, ball towing hitch attachment. If you are interested in our TERRA GROOM use the quick enquiry form below.